The rack-free design promotes high system flexibility with minimum form factor. The single-CPU architecture includes built-in Ethernet and Mini-USB interfaces, a SD/ SDHC memory card slot for program storage and data logging, and 24 digital I/O for simple high-speed counting and positioning functions. The high-performance CPU also includes a CC-Link V2 Master/Local station for connection to the powerful open field network CC-Link. Besides the functions already built-in, the CPU can be supplemented with up to 10 extension and special function modules for additional digital and analog I/Os, highspeed counters, communications interfaces, Simple Motion, positioning etc. . The compact size, easy expandability, networking capabilities, and multitude of built-in high-powered functions makes the L series ideal for both stand-alone machines as well as networked stations in larger applications. The L series CPU has all the most important features normally needed already built-in. This minimizes hardware and engineering costs significantly. Every L series CPU comes with 24 points of built-in I/Os as standard. 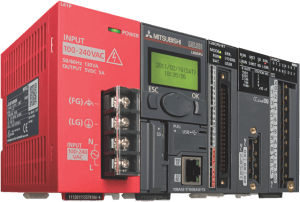 These I/O points are capable of many functions usually reserved for separate modules. Save on system costs by using the built-in functions for a variety of applications. Configuring built-in I/O functions can be done easily by setting parameters using the programming tool. The built-in data logging function provides an easy way to collect information for troubleshooting, performance evaluation, and other uses. The included configuration tool makes setting up the data logging function a breeze with a step-by-step wizard like interface. Using GX LogViewer, the captured data is easy to interpret and understand. The built-in positioning function has a start time of just 30 μs with a maximum high speed output of 200 k pulses per second. Furthermore, it supports S-curve acceleration and deceleration for applications that require minimal machine vibration. Two channels support the high speed counting function. The differential line driver inputs support counting speeds up to 200 k pulses per second. By the use of the optional Simple Motion modules, the user has the possibility to realize high-end motion applications with up to 16 synchronized axes. Use the SD/SDHC compatible memory card to quickly and easily back-up the CPU programs and parameters. The backups can then be just as easily restored or used to program other CPUs. The memory card can also be used to hold data captured with the data logging function.